"Rodent ulcer" redirects here. For the skin condition in cats, see Eosinophilic granuloma. Basal-cell carcinoma (BCC), also known as basal-cell cancer, is the most common type of skin cancer. It often appears as a painless raised area of skin, which may be shiny with small blood vessels running over it; or it may present as a raised area with ulceration. Basal-cell cancer grows slowly and can damage the tissue around it but is unlikely to spread to distant areas or to result in death. Risk factors include exposure to ultraviolet light, having lighter skin, radiation therapy, long-term exposure to arsenic, and poor immune-system function. Exposure to UV light during childhood is particularly harmful. Tanning beds have become another common source of ultraviolet radiation. Diagnosis often depends on skin examination, confirmed by tissue biopsy. It remains unclear whether sunscreen affects the risk of basal-cell cancer. Treatment is typically by surgical removal. This can be by simple excision if the cancer is small; otherwise Mohs surgery is generally recommended. Other options may include application of cold, topical chemotherapy, laser surgery, or the use of imiquimod. In the rare cases in which distant spread has occurred, chemotherapy or targeted therapy may be used. Basal-cell cancer accounts for at least 32% of all cancers globally. Of skin cancers other than melanoma, about 80% are basal-cell cancers. In the United States, about 35% of white males and 25% of white females are affected by BCC at some point in their lives. Individuals with a basal-cell carcinoma typically present with a shiny, pearly skin nodule. However, superficial basal-cell cancer can present as a red patch similar to eczema. Infiltrative or morpheaform basal-cell cancers can present as a skin thickening or scar tissue – making diagnosis difficult without using tactile sensation and a skin biopsy. It is often difficult to visually distinguish basal-cell cancer from acne scar, actinic elastosis, and recent cryodestruction inflammation. About two thirds of basal-cell carcinomas occur on sun-exposed areas of the body. One-third occur on areas of the body that are not exposed to sunlight, emphasizing the genetic susceptibility of basal-cell cancer. Basal-cell carcinomas are currently considered to have origin from the folliculo-sebaceous-apocrine germ, also known as trichoblast. The differential diagnosis with trichoblastic carcinoma, a rare malignant form of trichoblastoma, can be challenging. Alternatively, one argument is that basal-cell carcinoma is trichoblastic carcinoma. Overexposure to sun leads to the formation of thymine dimers, a form of DNA damage. While DNA repair removes most UV-induced damage, not all crosslinks are excised. There is, therefore, cumulative DNA damage leading to mutations. Apart from the mutagenesis, overexposure to sunlight depresses the local immune system, possibly decreasing immune surveillance for new tumor cells. Basal-cell carcinomas can often come in association with other lesions of the skin, such as actinic keratosis, seborrheic keratosis, squamous cell carcinoma. 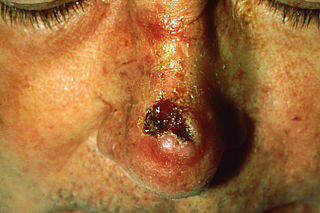 In a small proportion of cases, basal-cell carcinoma also develops as a result of basal-cell nevus syndrome, or Gorlin Syndrome, which is also characterized by keratocystic odontogenic tumors of the jaw, palmar or plantar (sole of the foot) pits, calcification of the falx cerebri (in the center line of the brain) and rib abnormalities. The cause of this syndrome is a mutation in the PTCH1 tumor suppressor gene located in chromosome 9q22.3, which inhibits the hedgehog signaling pathway. A mutation in the SMO gene, which is also on the hedgehog pathway, also causes basal-cell carcinoma. To diagnose basal-cell carcinomas, a skin biopsy is performed for histopathologic analyses. The most common method is a shave biopsy under local anesthesia. Most nodular basal-cell cancers can be diagnosed clinically; however, other variants can be very difficult to distinguish from benign lesions such as intradermal naevus, sebaceomas, fibrous papules, early acne scars, and hypertrophic scarring. Basal-cell carcinoma can be divided into three groups, based on the growth patterns. Superficial basal-cell carcinoma, formerly referred to in-situ basal-cell carcinoma, is characterized by a superficial proliferation of neoplastic basal-cells. This tumor is generally responsive to topic chemotherapy, such as imiquimod, or fluorouracil. Infiltrative basal-cell carcinoma, which also encompasses morpheaform and micronodular basal-cell cancer, is more difficult to treat with conservative methods, given its tendency to penetrate into deeper layers of the skin. Nodular basal-cell carcinoma includes most of the remaining categories of basal-cell cancer. It is not unusual to encounter heterogeneous morphologic features within the same tumor. Pigmented basal-cell carcinoma exhibits increased melanization. :748:647 About 80% of all basal-cell carcinoma in Chinese are pigmented while this subtype is uncommon in white people. Basal-cell carcinoma is a common skin cancer and occurs mainly in fair-skinned patients with a family history of this cancer. Sunlight is a factor in about two-thirds of these cancers; therefore, doctors recommend sunscreens with at least SPF 30. However, a Cochrane review examining the effect of solar protection (sunscreen only) in preventing the development of basal-cell carcinoma or cutaneous squamous cell carcinoma found that there was insufficient evidence to demonstrate whether sunscreen was effective for the prevention of either of these keratinocyte-derived cancers. The review did ultimately state that the certainty of these results were low, so future evidence could very well alter this conclusion. One-third occur in non-sun-exposed areas; thus, the pathogenesis is more complex than UV exposure as the cause. The use of a chemotherapeutic agent such as 5-Fluorouracil or imiquimod can prevent development of skin cancer. It is usually recommended to individuals with extensive sun damage, history of multiple skin cancers, or rudimentary forms of cancer (i.e., solar keratosis). It is often repeated every 2 to 3 years to further decrease the risk of skin cancer. This can be with either frozen section histology, or paraffin-embedded fixed-tissue pathology. It is the preferred method for removal of most BCCs. A dermatoscope can help an experienced surgeon accurately identify the visible tumour that the naked eye can not see. The cure rate for this method, whether performed by a General Surgeon, Otolaryngologist, Head & Neck Surgeon, Plastic Surgeon, Maxillofacial Surgeon or dermatologist is totally dependent on the surgical margin. The narrower the free surgical margin (skin removed that is free of visible tumor) the higher the recurrence rate. If a 4 mm free surgical margin is obtained around a small tumor (less than 6mm), or a wider 6 mm free surgical margin is obtained around a larger tumor (greater than 6mm), the cure rate is very high—95% or better. However, for cosmetic reasons, many doctors take only very small surgical margins 1–2 mm, especially when operating on the face. In such a case, a pathology report indicating the margins are free of residual tumour is often inaccurate, and recurrence rates are much higher (up to 38%). A weakness with standard surgical excision is the high recurrence rate of basal-cell cancers of the face, especially around the eyelids, nose, and facial structures. There is no clear approach for treating basal-cell carcinoma around the eye. A diagram on page 38 of the National Comprehensive Cancer Network publication demonstrate the area of high risk of recurrence as being most of the face with the exception of the central cheek and upper forehead. On the face, or on recurrent basal-cell cancer after previous surgery, special surgical margin controlled processing (CCPDMA—complete circumferential peripheral and deep margin assessment) using frozen section histology (Mohs surgery is one of the methods) is required. With surgical margin controlled frozen section histology, a surgeon can achieve a high cure rate and low recurrence rate on the same day of the excision. However, most standard excisions done in a plastic surgeon or dermatologist's office are sent to an outside laboratory for standard bread loafing method of processing. With this method, it is likely that less than 5% of the surgical margin is examined, as each slice of tissue is only 6 micrometres thick, about 3 to 4 serial slices are obtained per section, and only about 3 to 4 sections are obtained per specimen (see figure 2 of reference). When in doubt,[clarification needed] a patient should demand that either Mohs surgery or frozen section histology with either margin control (ccpdma) or thin serial bread-loafing is utilized when dealing with a tumour on the face. The pathologist processing the frozen section specimen should cut multiple sections through the block to minimize the false negative error rate. Or one should simply process the tissue utilizing a method approximating the Mohs method (described in most basic histopathology text books or described in this reference ) during frozen section processing. Unfortunately, these methods are difficult when applied to frozen sections; and they are very tedious to process. When not utilizing frozen section, the surgeon might have to wait a week or more before informing the patient if more tumour is left, or if the surgical margin is too narrow. A second surgery must be performed to remove the residual or potential residual tumour once the surgeon informs the patient of the positive or narrow surgical margin on the surgical pathology report. A meta-analysis of randomized controlled trials supports surgery as the most effective treatment of BCC of the skin. There is no clear research comparing the effectiveness of Mohs micrographic surgery versus surgical excision for BCC of the eye. Mohs surgery (or Mohs micrographic surgery) is an outpatient procedure, which was developed by Frederic E. Mohs in the 1940s, in which the tumor is surgically excised and then immediately examined under a microscope. It is a form of pathology processing called CCPDMA. The base and edges are microscopically examined to verify sufficient margins before the surgical repair of the site. If the margins are insufficient, more is removed from the patient until the margins are sufficient. It is also used for squamous-cell carcinoma; however, the cure rate is not as high as Mohs surgery for basal-cell carcinoma. The 2008 study found MMS to be a good option for both primary and high-risk recurrent BCCs. Cryosurgery is an old modality for the treatment of many skin cancers. When accurately utilized with a temperature probe and cryotherapy instruments, it can result in very good cure rate. Disadvantages include lack of margin control, tissue necrosis, over or under treatment of the tumor, and long recovery time. Overall, there are sufficient data to consider cryosurgery as a reasonable treatment for BCC. There are no good studies, however, comparing cryosurgery with other modalities, particularly with Mohs surgery, excision, or electrodesiccation and curettage so that no conclusion can be made whether cryosurgery is as efficacious as other methods. Also, there is no evidence on whether curetting the lesions before cryosurgery affects the efficacy of treatment. Several textbooks are published on the therapy, and a few physicians still apply the treatment to selected patients. Electrodesiccation and curettage (EDC, also known as curettage and cautery, simply curettage) is accomplished by using a round knife, or curette, to scrape away the soft cancer. The skin is then burned with an electric current. This further softens the skin, allowing for the knife to cut more deeply with the next layer of curettage. The cycle is repeated, with a safety margin of curettage of normal skin around the visible tumor. This cycle is repeated 3 to 5 times, and the free skin margin treated is usually 4 to 6 mm. Cure rate is very much user-dependent and depends also on the size and type of tumor. Infiltrative or morpheaform BCCs can be difficult to eradicate with EDC. Generally, this method is used on cosmetically unimportant areas like the trunk (torso). Some physicians believe that it is acceptable to utilize EDC on the face of elderly patients over the age of 70. However, with increasing life expectancy, such an objective criterion cannot be supported. The cure rate can vary, depending on the aggressiveness of the EDC and the free margin treated. Some advocate curettage alone without electrodesiccation, and with the same cure rate. Some superficial cancers respond to local therapy with 5-fluorouracil, a chemotherapy agent. Topical treatment with 5% Imiquimod cream, with five applications per week for six weeks has a reported 70–90% success rate at reducing, even removing, the BCC [basal-cell carcinoma]. Both Imiquimod and 5-fluorouracil have received FDA approval, and topical IMQ is approved by the European Medicines Agency for treatment of small superficial basal-cell carcinoma. Off label use of imiquimod on invasive basal-cell carcinoma has been reported. Imiquimod may be used prior to surgery in order to reduce the size of the carcinoma. One can expect a great deal of inflammation with this treatment. Chemotherapy often follows Mohs surgery to eliminate the residual superficial basal-cell carcinoma after the invasive portion is removed. Some advocate the use of imiquimod prior to Mohs surgery to remove the superficial component of the cancer. Removing the residual superficial tumor with surgery alone can result in large and difficult to repair surgical defects. One often waits a month or more after surgery before starting the Imiquimod or 5-fluorouracil to make sure the surgical wound has adequately healed. Some people[who?] advocate the use of curettage (see EDC below) first, followed by chemotherapy. These experimental procedures are not standard care. The 2008 study reported that topical IMQ appears effective in the treatment of primary small superficial BCCs but only "may possibly" have a role in the treatment of primary nodular BCC. Approved in 2012, vismodegib is used to treat an advanced form of basal-cell carcinoma. Immunotherapy research suggests that treatment using Euphorbia peplus, a common garden weed, may be effective. Australian biopharmaceutical company Peplin is developing this as topical treatment for BCC. Imiquimod is an immunotherapy but is listed here under chemotherapy. Radiation therapy can be delivered either as external beam radiotherapy or as brachytherapy (internal radiotherapy). Although radiotherapy is generally used in older patients who are not candidates for surgery, it is also used in cases where surgical excision will be disfiguring or difficult to reconstruct (especially on the tip of the nose, and the nostril rims). Radiation treatment often takes as few as 5 visits to as many as 25 visits. Usually, the more visits scheduled for therapy, the less complication or damage is done to the normal tissue supporting the tumor. Radiotherapy can also be useful if surgical excision has been done incompletely or if the pathology report following surgery suggests a high risk of recurrence, for example if nerve involvement has been demonstrated. Cure rate can be as high as 95% for small tumor, or as low as 80% for large tumors. Usually, recurrent tumors after radiation are treated with surgery, and not with radiation. Further radiation treatment will further damage normal tissue, and the tumor might be resistant to further radiation. Radiation therapy may be contraindicated for treatment of nevoid basal-cell carcinoma syndrome. A meta-analysis of randomized controlled trials supports radiotherapy as one of the most effective treatments for BCC. A 2008 study reported that radiation therapy is appropriate for primary BCCs and recurrent BCCs, but not for BCCs that have recurred following previous radiation treatment. Photodynamic therapy (PDT) is a new modality for treatment of basal-cell carcinoma, which is administrated by application of photosensitizers to the target area. When these molecules are activated by light, they become toxic, therefore destroy the target cells. Methyl aminolevulinate is approved by EU as a photosensitizer since 2001. This therapy is also used in other skin cancer types. The 2008 study reported that PDT was a good treatment option for primary superficial BCCs and reasonable for primary low-risk nodular BCCs but a "relatively poor" option for high-risk lesions. Basal-cell cancer is a very common skin cancer. It is much more common in fair-skinned individuals with a family history of basal-cell cancer and increases in incidence closer to the equator or at higher altitude. There are approximately 800,000 new cases yearly in the United States alone. Up to 30% of Caucasians develop basal-cell carcinomas in their lifetime. In Canada, the most common skin cancer is basal-cell carcinoma (as much as one third of all cancer diagnoses), affecting 1 in 7 individuals over a lifetime. In the United States approximately 3 out of 10 caucasians develop a basal-cell carcinoma during their lifetime. This tumor accounts for approximately 70% of non-melanoma skin cancers. In 80 percent of all cases, basal-cell carcinoma affects the skin of head and neck. Furthermore, there appears to be an increase in the incidence of basal-cell cancer of the trunk in recent years. Most sporadic BCC arises in small numbers on sun-exposed skin of people over age 50, although younger people may also be affected. The development of multiple basal-cell cancer at an early age could be indicative of nevoid basal-cell carcinoma syndrome, also known as Gorlin's Syndrome. ^ a b "Skin Cancer Treatment (PDQ®)". NCI. 2013-10-25. Archived from the original on 5 July 2014. Retrieved 30 June 2014. ^ a b c d e f g h i j Gandhi SA, Kampp J (November 2015). "Skin Cancer Epidemiology, Detection, and Management". The Medical Clinics of North America. 99 (6): 1323–35. doi:10.1016/j.mcna.2015.06.002. PMID 26476255. ^ a b "Skin Cancer Treatment". National Cancer Institute. 21 June 2017. Archived from the original on 4 July 2017. Retrieved 2 July 2017. ^ Krutmann J, Humbert P (2010). Nutrition for Healthy Skin: Strategies for Clinical and Cosmetic Practice. Springer Science & Business Media. p. 31. ISBN 9783642122644. Archived from the original on 2017-09-10. ^ a b World Cancer Report 2014. World Health Organization. 2014. pp. Chapter 5.14. ISBN 978-9283204299. ^ GBD 2015 Mortality and Causes of Death, Collaborators (October 2016). "Global, regional, and national life expectancy, all-cause mortality, and cause-specific mortality for 249 causes of death, 1980-2015: a systematic analysis for the Global Burden of Disease Study 2015". Lancet. 388 (10053): 1459–1544. doi:10.1016/s0140-6736(16)31012-1. PMC 5388903. PMID 27733281. ^ a b Cakir BÖ, Adamson P, Cingi C (November 2012). "Epidemiology and economic burden of nonmelanoma skin cancer". Facial Plastic Surgery Clinics of North America. 20 (4): 419–22. doi:10.1016/j.fsc.2012.07.004. PMID 23084294. ^ Gallagher RP, Lee TK, Bajdik CD, Borugian M (2010). "Ultraviolet radiation". Chronic Diseases in Canada. 29 Suppl 1: 51–68. PMID 21199599. The major source of ultraviolet radiation is solar radiation or sunlight. However, exposure to artificial sources particularly through tanning salons is becoming more important in terms of human health effects, as use of these facilities by young people, [sic] has increased. ^ Jou PC, Feldman RJ, Tomecki KJ (June 2012). "UV protection and sunscreens: what to tell patients". Cleveland Clinic Journal of Medicine. 79 (6): 427–36. doi:10.3949/ccjm.79a.11110. PMID 22660875. ^ Laffay L, Depaepe L, d'Hombres A, Balme B, Thomas L, De Bari B (2012). "Histological features and treatment approach of trichoblastic carcinomas: from a case report to a review of the literature". Tumori. 98 (2): 46e–49e. doi:10.1700/1088.11948. PMID 22678003. ^ Ackerman AB, Kerl H, Sánchez J, Guo Y (2000). "Basal-cell carcinoma: integration unifying concept". A clinical atlas of 101 common skin diseases : with histopathologic correlation. New York: Ardor Scribendi. ISBN 978-1-893357-10-5. ^ Fusco N, Lopez G, Gianelli U (September 2015). "Basal-Cell Carcinoma and Seborrheic Keratosis: When Opposites Attract". International Journal of Surgical Pathology. 23 (6): 464. doi:10.1177/1066896915593802. PMID 26135529. ^ Epstein EH, Shepard JA, Flotte TJ (January 2008). "Case records of the Massachusetts General Hospital. Case 3-2008. An 80-year-old woman with cutaneous basal-cell carcinomas and cysts of the jaws". The New England Journal of Medicine. 358 (4): 393–401. doi:10.1056/NEJMcpc0707893. PMID 18216361. ^ "What Is Basal Cell Cancer". SkinCancerGuide. Archived from the original on 2009-03-01. Retrieved 2009-02-18. ^ a b c d e f g Freedberg, et al. (2003). Fitzpatrick's Dermatology in General Medicine. (6th ed.). McGraw-Hill. ISBN 0-07-138076-0. ^ a b c d e f g h i j k l m James WD, Berger TG, et al. (2006). Andrews' Diseases of the Skin: clinical Dermatology. Saunders Elsevier. ISBN 978-0-7216-2921-6. ^ Sánchez G, Nova J, Rodriguez-Hernandez AE, Medina RD, Solorzano-Restrepo C, Gonzalez J, Olmos M, Godfrey K, Arevalo-Rodriguez I (July 2016). "Sun protection for preventing basal-cell and squamous cell skin cancers". The Cochrane Database of Systematic Reviews. 7: CD011161. doi:10.1002/14651858.CD011161.pub2. PMID 27455163. ^ Scalvenzi M, Lembo S, Francia MG, Balato A (October 2008). "Dermoscopic patterns of superficial basal cell carcinoma". International Journal of Dermatology. 47 (10): 1015–8. doi:10.1111/j.1365-4632.2008.03731.x. PMID 18986346. ^ Cuellar F, Vilalta A, Puig S, Palou J, Zaballos P, Malvehy J (September 2008). "Dermoscopy of early recurrent basal cell carcinoma". Archives of Dermatology. 144 (9): 1254. doi:10.1001/archderm.144.9.1254. PMID 18794487. ^ Maloney ME, Torres A, Hoffman TJ (1999). Surgical Dermatopathology. Cambridge, MA: Blackwell Publishers. p. 110. ISBN 978-0-86542-299-5. ^ Kimyai-Asadi A, Katz T, Goldberg LH, Ayala GB, Wang SQ, Vujevich JJ, Jih MH (December 2007). "Margin involvement after the excision of melanoma in situ: the need for complete en face examination of the surgical margins". Dermatologic Surgery. 33 (12): 1434–9, discussion 1439–41. doi:10.1111/j.1524-4725.2007.33313.x. PMID 18076608. ^ Mosterd K, Krekels GA, Nieman FH, Ostertag JU, Essers BA, Dirksen CD, Steijlen PM, Vermeulen A, Neumann H, Kelleners-Smeets NW (December 2008). "Surgical excision versus Mohs' micrographic surgery for primary and recurrent basal-cell carcinoma of the face: a prospective randomised controlled trial with 5-years' follow-up". The Lancet. Oncology. 9 (12): 1149–56. doi:10.1016/S1470-2045(08)70260-2. PMID 19010733. ^ Kimyai-Asadi A, Goldberg LH, Jih MH (September 2005). "Accuracy of serial transverse cross-sections in detecting residual basal-cell carcinoma at the surgical margins of an elliptical excision specimen". Journal of the American Academy of Dermatology. 53 (3): 469–74. doi:10.1016/j.jaad.2005.02.049. PMID 16112355. ^ Silverman MK, Kopf AW, Bart RS, Grin CM, Levenstein MS (June 1992). "Recurrence rates of treated basal-cell carcinomas. Part 3: Surgical excision". The Journal of Dermatologic Surgery and Oncology. 18 (6): 471–6. doi:10.1111/j.1524-4725.1992.tb03307.x. PMID 1592998. ^ a b Wolf, D. J (1987). "Surgical margins for basal cell carcinoma". Archives of Dermatology. 123 (3): 340–344. doi:10.1001/archderm.123.3.340. ^ Staub G, Revol M, May P, Bayol JC, Verola O, Servant JM (October 2008). "[Excision skin margin and recurrence rate of skin cancer: a prospective study of 844 cases]" [Excision skin margin and recurrence rate of skin cancer: a prospective study of 844 cases]. Annales De Chirurgie Plastique Et Esthetique (in French). 53 (5): 389–98. doi:10.1016/j.anplas.2007.07.015. PMID 17961898. ^ "Basal Cell Carcinoma". BC Cancer Agency. Archived from the original on 2009-02-02. Retrieved 2009-02-18. ^ a b Griffiths RW, Suvarna SK, Stone J (2007). "Basal cell carcinoma histological clearance margins: an analysis of 1539 conventionally excised tumours. Wider still and deeper?". Journal of Plastic, Reconstructive & Aesthetic Surgery. 60 (1): 41–7. doi:10.1016/j.bjps.2006.06.009. PMID 17126265. ^ a b Sigurdsson H, Agnarsson BA (August 1998). "Basal cell carcinoma of the eyelid. Risk of recurrence according to adequacy of surgical margins". Acta Ophthalmologica Scandinavica. 76 (4): 477–80. doi:10.1034/j.1600-0420.1998.760416.x. PMID 9716337. ^ Hauben DJ, Zirkin H, Mahler D, Sacks M (January 1982). "The biologic behavior of basal cell carcinoma: analysis of recurrence in excised basal cell carcinoma: Part II". Plastic and Reconstructive Surgery. 69 (1): 110–6. doi:10.1097/00006534-198269010-00018. PMID 7053498. ^ Farhi D, Dupin N, Palangié A, Carlotti A, Avril MF (October 2007). "Incomplete excision of basal cell carcinoma: rate and associated factors among 362 consecutive cases". Dermatologic Surgery. 33 (10): 1207–14. doi:10.1111/j.1524-4725.2007.33255.x. PMID 17903153. ^ a b Narayanan K, Hadid OH, Barnes EA (December 2014). "Mohs micrographic surgery versus surgical excision for periocular basal-cell carcinoma". The Cochrane Database of Systematic Reviews (12): CD007041. doi:10.1002/14651858.CD007041.pub4. PMID 25503105. ^ Dhingra N, Gajdasty A, Neal JW, Mukherjee AN, Lane CM (June 2007). "Confident complete excision of lid-margin BCCs using a marginal strip: an alternative to Mohs' surgery". The British Journal of Ophthalmology. 91 (6): 794–6. doi:10.1136/bjo.2006.109892. PMC 1955612. PMID 17229804. ^ Minton TJ (August 2008). "Contemporary Mohs surgery applications". Current Opinion in Otolaryngology & Head and Neck Surgery. 16 (4): 376–80. doi:10.1097/MOO.0b013e3283079cac. PMID 18626258. ^ Botha JL, Vinik AI, Brown JC (May 1976). "Gastric inhibitory polypeptide (GIP) in chronic pancreatitis". The Journal of Clinical Endocrinology and Metabolism. 42 (5): 791–7. doi:10.1046/j.1468-3083.2003.00535.x. PMID 1270574. ^ Lane JE, Kent DE (2005). "Surgical margins in the treatment of nonmelanoma skin cancer and mohs micrographic surgery". Current Surgery. 62 (5): 518–26. doi:10.1016/j.cursur.2005.01.003. PMID 16125611. ^ Maloney ME, Torres A, Hoffman TJ (1999). Surgical Dermatopathology. Cambridge, MA: Blackwell Publishers. p. 113. ISBN 978-0-86542-299-5. ^ Grzybicki DM, Geisinger KR, Silverman JF, Dabbs DJ, Brewer N, Raab SS (2000). "Physician perceptions and expectations of cytology and surgical pathology turn around time (TAT)". Association for Health Services Research Meeting. Los Angeles. Archived from the original on 2008-10-10. Retrieved 2009-02-18. ^ a b Bath-Hextall FJ, Perkins W, Bong J, Williams HC (January 2007). "Interventions for basal cell carcinoma of the skin". The Cochrane Database of Systematic Reviews (1): CD003412. doi:10.1002/14651858.CD003412.pub2. PMID 17253489. ^ a b c d e f g Telfer NR, Colver GB, Morton CA (July 2008). "Guidelines for the management of basal-cell carcinoma". The British Journal of Dermatology. 159 (1): 35–48. doi:10.1111/j.1365-2133.2008.08666.x. PMID 18593385. ^ Kokoszka A, Scheinfeld N (June 2003). "Evidence-based review of the use of cryosurgery in treatment of basal-cell carcinoma". Dermatologic Surgery. 29 (6): 566–71. doi:10.1046/j.1524-4725.2003.291511.x. PMID 12786697. ^ "Understanding Actinic Keratosis -- Treatment". Web MD. Archived from the original on 2007-08-11. Retrieved 2008-12-05. ^ Barlow JO, Zalla MJ, Kyle A, DiCaudo DJ, Lim KK, Yiannias JA (June 2006). "Treatment of basal cell carcinoma with curettage alone". Journal of the American Academy of Dermatology. 54 (6): 1039–45. doi:10.1016/j.jaad.2006.01.041. PMID 16713459. ^ Butler DF, Parekh PK, Lenis A (January 2009). "Imiquimod 5% cream as adjunctive therapy for primary, solitary, nodular nasal basal-cell carcinomas before Mohs micrographic surgery: a randomized, double blind, vehicle-controlled study". Dermatologic Surgery. 35 (1): 24–9. doi:10.1111/j.1524-4725.2008.34378.x. PMID 19018814. ^ "Vismodegib, First Hedgehog Inhibitor, Approved for BCC Patients". Archived from the original on 2015-02-22. ^ "Peplin's skin cancer gel trial a success". The Age. Melbourne. 1 May 2006. Archived from the original on 16 June 2006. ^ Peng Q, Juzeniene A, Chen J, Svaasand LO, Warloe T, Giercksky K, Moan J (2008). "Lasers in medicine". Reports on Progress in Physics. 71 (5): 056701. doi:10.1088/0034-4885/71/5/056701. ^ a b c d Wong CS, Strange RC, Lear JT (October 2003). "Basal cell carcinoma". BMJ. 327 (7418): 794–8. doi:10.1136/bmj.327.7418.794. PMC 214105. PMID 14525881. ^ "Epidemiology of Skin Cancer". BC Cancer Agency. Archived from the original on 2011-05-14. Retrieved 2011-06-25. ^ Gorlin†, Robert J (2008). "Nevoid Basal Cell Carcinoma (Gorlin) Syndrome". Neurocutaneous Disorders Phakomatoses and Hamartoneoplastic Syndromes. pp. 669–694. doi:10.1007/978-3-211-69500-5_45. ISBN 978-3-211-21396-4. Skin cancers are cancers that arise from the skin. They are due to the development of abnormal cells that have the ability to invade or spread to other parts of the body. There are three main types of skin cancers: basal-cell skin cancer (BCC), squamous-cell skin cancer (SCC) and melanoma. The first two, along with a number of less common skin cancers, are known as nonmelanoma skin cancer (NMSC). Basal-cell cancer grows slowly and can damage the tissue around it but is unlikely to spread to distant areas or result in death. It often appears as a painless raised area of skin, that may be shiny with small blood vessels running over it or may present as a raised area with an ulcer. Squamous-cell skin cancer is more likely to spread. It usually presents as a hard lump with a scaly top but may also form an ulcer. Melanomas are the most aggressive. Signs include a mole that has changed in size, shape, color, has irregular edges, has more than one color, is itchy or bleeds. Squamous-cell skin cancer, also known as cutaneous squamous-cell carcinoma (cSCC), is one of the main types of skin cancer along with basal cell cancer, and melanoma. It usually presents as a hard lump with a scaly top but can also form an ulcer. Onset is often over months. Squamous-cell skin cancer is more likely to spread to distant areas than basal cell cancer. Dermatofibrosarcoma protuberans (DFSP) is a rare tumor of the dermis layer of the skin, and is classified as a sarcoma. There is only about one case per million per year. DFSP is a fibrosarcoma, more precisely a cutaneous soft tissue sarcoma. In many respects, the disease behaves as a benign tumor, but in 2–5% of cases it can metastasize, so it should be considered to have malignant potential. It occurs most often in adults in their thirties; it has been described congenitally, in children, and the elderly. It accounts for approximately 2–6% of soft tissue sarcoma cancers. Actinic keratosis (AK) is a pre-cancerous area of thick, scaly, or crusty skin. These growths are more common in fair-skinned people and those who are frequently in the sun. They are believed to form when skin gets damaged by ultraviolet (UV) radiation from the sun or indoor tanning beds, usually over the course of decades. Given their pre-cancerous nature, if left untreated they may turn into a type of skin cancer called squamous cell carcinoma. Untreated lesions have up to a 20% risk of progression to squamous cell carcinoma, so treatment by a dermatologist is recommended. Merkel-cell carcinoma (MCC) is a rare and highly aggressive skin cancer, which, in most cases, is caused by the Merkel cell polyomavirus discovered by scientists at the University of Pittsburgh in 2008. It is also known as cutaneous APUDoma, primary neuroendocrine carcinoma of the skin, primary small cell carcinoma of the skin, and trabecular carcinoma of the skin. Lentigo maligna is a melanoma in situ that consists of malignant cells but does not show invasive growth. Lentigo maligna is not the same as lentigo maligna melanoma, and should be discussed separately. It typically progresses very slowly and can remain in a non-invasive form for years. The transition to true melanoma is marked by the appearance of a bumpy surface, at which point it is called lentigo maligna melanoma. It is normally found in the elderly, on skin areas with high levels of sun exposure like the face and forearms. Some authors do not consider lentigo maligna to be a melanoma. It is commonly thought of as a melanoma precursor. Incidence of evolution to lentigo maligna melanoma is low, about 2.2% to 5% in elderly patients. Keratoacanthoma (KA) is a common low-grade rapidly-growing skin tumour that is believed to originate from the hair follicle and can resemble squamous cell carcinoma. Imiquimod (INN) is a prescription medication that acts as an immune response modifier and is used to treat genital warts, superficial basal cell carcinoma, and actinic keratosis. Scientists at 3M's pharmaceuticals division discovered the drug and 3M obtained the first FDA approval in 1997 under the brand Aldara. As of 2015, imiquimod is generic and is available worldwide under many brands. Mohs surgery, developed in 1938 by a general surgeon, Frederic E. Mohs, is microscopically controlled surgery used to treat common types of skin cancer. During the surgery, after each removal of tissue and while the patient waits, the tissue is examined for cancer cells. That examination informs the decision for additional tissue removal. Mohs surgery is the gold standard method for obtaining complete margin control during removal of a skin cancer using frozen section histology. CCPDMA or Mohs surgery allows for the removal of a skin cancer with very narrow surgical margin and a high cure rate. A resection margin or surgical margin is the margin of apparently non-tumorous tissue around a tumor that has been surgically removed, called "resected", in surgical oncology. The resection is an attempt to remove a cancer tumor so that no portion of the malignant growth extends past the edges or margin of the removed tumor and surrounding tissue. These are retained after the surgery and examined microscopically by a pathologist to see if the margin is indeed free from tumor cells. If cancerous cells are found at the edges the operation is much less likely to achieve the desired results. Sebaceous carcinoma, also known as sebaceous gland carcinoma (SGc), sebaceous cell carcinoma, and mebomian gland carcinoma is an uncommon and aggressive malignant cutaneous tumor. Most are typically about 10 mm in size at presentation. This neoplasm is thought to arise from sebaceous glands in the skin and, therefore, may originate anywhere in the body where these glands are found. Sebaceous carcinoma can be divided into 2 types: ocular and extraocular. Because the periocular region is rich in this type of gland, this region is a common site of origin. The cause of these lesions are, in the vast majority of cases, unknown. Occasional cases may be associated with Muir-Torre syndrome. Due to the rarity of this tumor and variability in clinical and histological presentation, SGc is often misdiagnosed as an inflammatory condition or a more common type of tumor. Microcystic adnexal carcinoma (MAC) is a rare sweat gland cancer, which often appears as a yellow spot or bump in the skin. It usually occurs in the neck or head, although cases have been documented in other areas of the body. Most diagnosis occur past the age of 50. Although considered an invasive cancer, metastasis rarely occurs. Main treatments are wide local excision or Mohs micrographic surgery, which ensures that most, if not all, cancer cells are removed surgically.